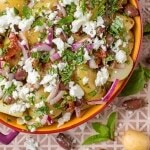 Mediterranean cuisine includes elements from many different countries and we have lots of recipes to choose from. 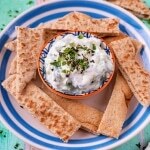 From Salads to Dips to incredible Meat Dishes, find the perfect recipe to wow your guests or your loved ones! Start putting some adventure back into your meal planning, we can help! 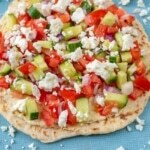 Make sure that lunch time is never boring again with these Greek Hummus Flatbreads. Easy to adapt, and ready in minutes, they are packed full of colour and sure to be a crowd-pleaser. 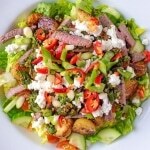 Spicy Steak and Roasted Potato Salad with Chermoula Dressing. It is possibly the best salad I have ever made, with a Dressing you will want to put on everything, so you are in for a treat! 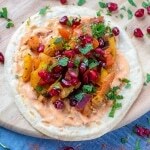 Lunchtimes never need to be boring again with these Moroccan Vegetable Rotis with Harissa Yoghurt. 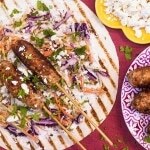 Bursting with North African spices, full of colour and a touch of spice, you will never have a boring sandwich again. These Veggie Packed Lamb Koftas are easy to cook in a big batch and we have found a way to sneak some extra vegetables in to a meaty dish. 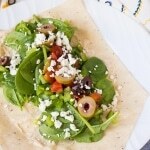 Sandwiches and wraps are a lunchtime time saver and perfect for lunch boxes. 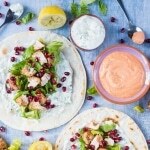 Don’t get stuck in a filling rut – try these Greek Hummus Wraps and save yourself some calories by using a Deli Kitchen Skinni Wrap too.